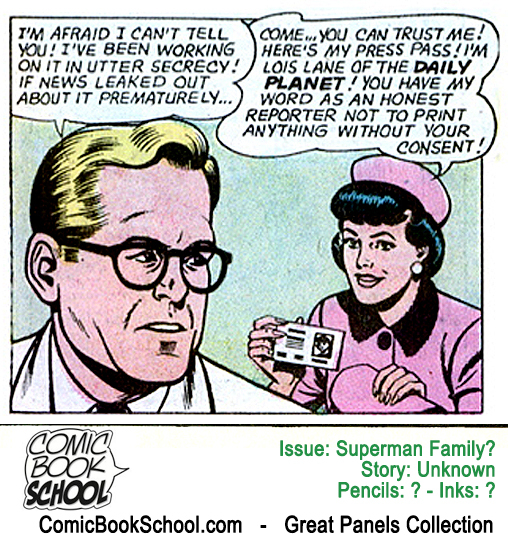 From the Great Panels collection, Lois Lane as an honest reporter. Yep, there was a time when journalists were trustworthy. It was no accident that Superman’s alter ego Clark Kent was a newspaper reporter. Lois Lane Honest Reporter from the Daily Planet. You can trust her. Times have certainly changed. Enjoy this flashback to a simpler time when the press badge meant something. For a more elaborate rant on the sad state of journalism, check out: Superman, Journalism, & Next Generation Media on my other blog. Note: I’m not entirely sure where this panel originally appeared, but I think it was in a classic issue of “Superman Family.” If you know the details around the issue and the creators, please let me know in the comments.